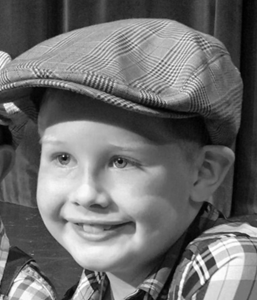 Liam Charles Shipley died peacefully at the age of 8 years old in the loving arms of his Mommy and Daddy on Friday, July 8th at 9:24pm at Children’s Mercy Hospital in Kansas City, Missouri. His final days were spent surrounded in love by his family and friends. Liam was in remission from Acute Lymphoblastic Leukemia, yet the effects of the chemo weakened his immune system and he developed a very rare fungal infection. He never quit fighting until his body could fight no more. God needed Liam to fight in his army to promote peace, strength and bravery to others. We are comforted knowing that each day Liam spent here on earth was a gift to all of those who came to know him. Whether they spent one day with him playing catch and taking pictures or hours in the Cancer clinic listening to him tell jokes or do magic…they just couldn’t help but love him. Liam taught us many things this past year. Liam taught the nurses how to dance, laugh, and all about Pokémon. He taught the doctors that Liam was following his own medical book and not theirs. He taught his family and friends that you never know how strong you are until it’s the only choice you have. Liam leaves behind many amazing caregivers from Children’s Mercy Hospital. The amazing nurses from 4 Henson, 2 Henson, the PICU and all of the other clinics we had to visit this past year, have always been so kind and loving. The doctors and surgeons truly gave Liam the most excellent care and showed us their true compassion for children’s lives. Our family was blessed to be a part of the Children’s Mercy family and we will always be grateful for their amazing care. Liam is survived by his loving parents, Trevor and Stacy Shipley, sisters Madeline and Lorelei, and brother Declan, as well as numerous great-grandparents, grandparents, aunts, uncles, cousins, friends, and fairy godmothers. To leave a special message for the family please use the "share memories" tab above. Add your memories to the guest book of Liam Shipley. Please know that you have all been in our thoughts and prayers during Liam's treatment and even more so now that he is gone to heaven with Jesus and the angels. Somehow I can see our Mother and yours, Linda, meeting him and ready to help him up there. Just know that we all love you so and are continuing to hold you up in prayer. All of our love, Nita ,Jeff and Sandie. It's only fitting that you are given a child whose an angel now. You are an amazing teacher, friend and mother. God knew you would handle this whole illness with Grace and Faith, and knew your family was Strong enough to endure this earthly pain that most of us can never imagine! You make differences in people's lives, you take time for everyone to educate them, love them unconditionally and share your pure Joy with the world. My heart breaks for your family, tears run down my face for your loss...but then again, you chose celebrating, so a smile turns my frown, upsidedown...knowing that Liam is in Jesus arms, pain free, needle free and cancer free. Hugs and love to you all! Continue to shine for Jesus and be the light of this earthly world. Julie my heart and thoughts are with you. Please know that I care and I'm here. You are in our thoughts and prayers forever in our hearts. My condolences to you and your family. May God strengthen you for the days to come. For this precious little one I have prayed. Dr Hoos was in the midst of my cancer journey with me and we often talked about his precious grandson. He was a proud grandpa and spoke lovingly of his family, the upcoming wedding in which he would wear a kilt and his chipmunk/rabbit issues. Praying for peace,comfort and wonderful memories as you face the days ahead. Dear Stacy and Trevor and Family: Your little Liam brought such joy and loving to this world of ours and will be missed forever. What a fighter he was, and he will be one of God's angels forever. Our thoughts and our prayers go out to all of you and hope that will bring peace and strength in this time of loss. Please know that you are surrounded by so many who love and support you at this time. May God bless you all and surround you with His love and comfort at this most difficult time. Stacy and Linda, my heart goes out to you and your family in the loss of your beautiful Liam. May you find some comfort and peace in the love of your friends who are grieving with you. I prayed for your little one to be healed, but we know God has a day pre-set to take us home, this was Liam's special day to meet Jesus! I will now be praying for your family's strength and peace. Oh, Julie, whoever wrote that beautiful obit for Liam really caught his spirit and described it to all of us who mourn with you. Yes, he IS in God’s army now and from what was written, he lived a life way beyond his eight years and was sent as a teacher for many. The mysteries of God! Just think….not only is he free from medicines and procedures and pain…..he is now a heavenly intercessor for your family, for all whom he loved, and probably for many more as part of the Church Triumphant. Nonetheless, he leaves a big hole in his family’s physical world so I will be praying with Liam for all of you. That God in His mercy and Mary in her immaculate love will embrace your bodies and your souls and give you the peace the passes all understanding. My thoughts and prayers are with your family. May God give you comfort, peace and strength during this very sad time. Liam was and always will be one of my very favorite patients! Such an amazing, fun, loving kid! Praying for you all! Rest in peace sweet friend! I am one who only got to spend a few hours with Liam and your awesome family but he had a huge impact on me. Watching him have a blast with Danny Duffy at the Royals calendar shoot touched my heart and put such a big smile on my face. I loved getting to know Liam as well as your whole family and I can't wait to hang up my Royals calendar next year and smile when it is Liam's month to be honored. I am so sorry Liam's time on earth was cut so short - your special boy will always be remembered! My heartfelt sympathy and prayers for you all in this sad time. Liam sounded like a wonderful little boy. May God grant you peace in your grief. Through Caring Bridge, we followed Liam's progress. His courage was unbelievable and the love for him showed up in each of the messages that we anxiously looked forward to. God chose him to be a special gift in his Heaven. May God give you the strength, comfort and love to help you move forward in this time of need. Our thoughts, hearts and prayers are with you always. Praying God will comfort you and bless you in the days ahead, and bring you strength.